Hi, my name is Carie, and I’m not ashamed to say that I’m ever so slightly addicted to watching the Great British Bake Off. I’ll admit I watch it with slightly mixed views; on the one hand I am firmly of the view that if you’ve baked something that tastes like a cake, looks vaguely like a cake and is iced with all the sprinkles in the cupboard then congratulations! 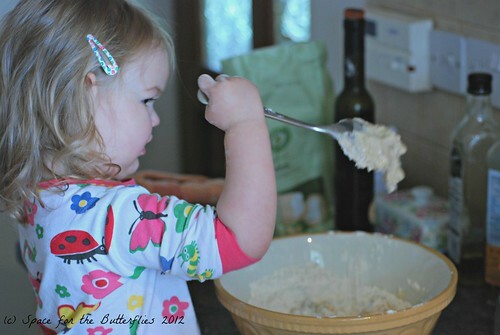 You’ve made a cake! But then there’s the rest of my personality. The ever so slightly teeny tiny bit of a competitive streak that propels me to the crazy heights of say, entering the art competition at the village show when I can neither paint nor draw, and baking more fruit cake than any one family could every possible eat (same village show, different category). It’s that inner voice that loves to see things done well, and then takes one look at the technical challenge and says “I could totally do that”. Baker, it’s time to put your money where your subconscious is. 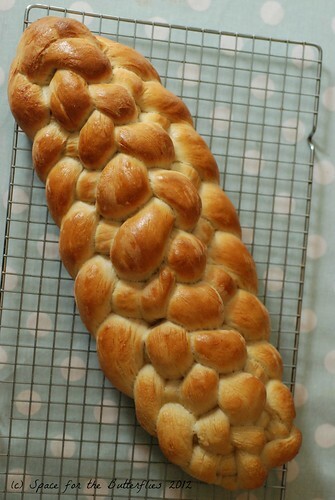 And as Rum Babas are out of the picture for me at the moment for somewhat obvious reasons it’s time to dive straight in to week 2, and the recipe that got my fingers twitching; the Eight Strand Plaited Loaf of doom. With my “Mel’n’Sue”, more frequently known as Kitty, on standby to offer enthusiastic assistance at every turn, we weighed, measured and got kneading, only slightly hindered by the ever liberal application of a bit more flour from Kit, who clearly felt that her time was best spent producing that authentic flour cloud so beloved by cartoonists, and tasting it as it landed. 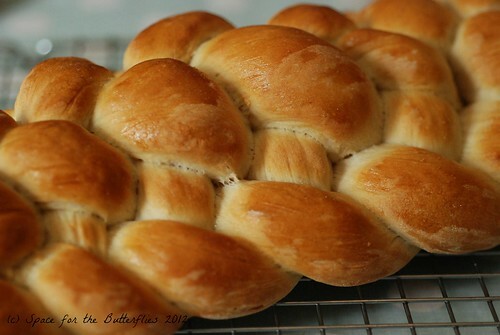 This recipe uses double the yeast I would normally use for a 1lb (ish) loaf, presumably to give a shorter rising time and perhaps to help countermand the effect of the plaiting later on. The other change from my normal breadmaking (and I was being pretty diligent about following along exactly) was to oil rather than flour the bowl for proving, a tip I think I’m going to pick up for everyday use. 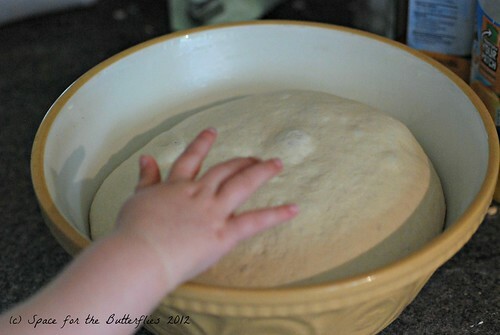 An hour or so, and Mel’n’Sue’s prod test later, about 2lb of bread dough slid gently out of the bowl. I’ll admit I distracted the tiny assistant with pink playdoh at this point (and I bet the contestants occasionally wish they could do the same) after Kitty’s initial attempts at rolling dough into sausages revealed a strong inclination to pull it into little bits and throw them on the floor. I caught it with my knees (an impressive feat considering I can’t really see them). 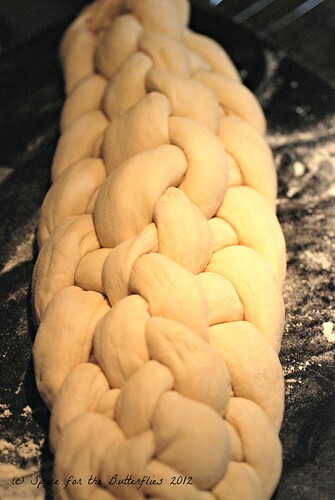 And so to the plaiting. Now I would probably have to concede that as a girl with seriously long hair throughout most of my teens, I’ve had a bit of practice at the standard ‘Little House on the Prairie’ pigtail, and that may have stood me in good stead. The first attempt was perfect until Mel’n’Sue started to eat the pink playdoh, which unsurprisingly is not as nice as even raw bread dough, and my attention was diverted to give cuddles and a nice long drink. When I got back I couldn’t for the life of me remember which step I was on. It was like being a new knitter who’s made a mistake but can’t read her knitting to find out where it’s all gone wrong; I can’t read an 8-strand plait. We left it to prove while Mel’n’Sue settled down for her nap, and after a 25ish minute stint in the oven, behold the rapturous glory of the bread! So what would Paul and Mary make of it? 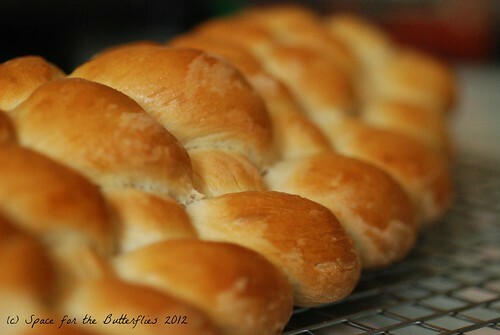 Well it was nicely baked through, I didn’t leave any floury lines showing between the plaits and it tasted really good, if a little saltier than my usual loaf mix. I think I’d loose a few points for the egg glaze not being entirely consistent, and perhaps my strands were a bit too long making the loaf a little flatter; think large baguette circumference not classic farmhouse – when we made sandwiches with it we sliced a chunk and cut it in half horizontally for beautiful ham sarnies. On the whole I think compared to the rest of the contestants my plaiting was up there so on that I declare myself through to next week! 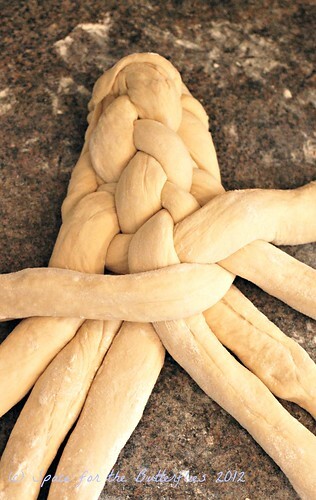 Could you tell me how to do an eight stranded plait?